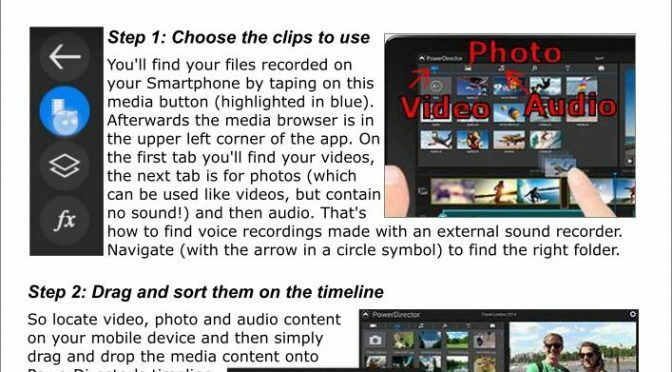 This is a short tutorial written for #MoJo journalists, who want to edit video on an Android Smartphone with the Cyberlink PowerDirector Mobile app. Copyright usage with courtesy of Cyberlink Europe B.V.
You’ll find your files recorded on your Smartphone by taping on this media button (highlighted in blue) in PowerDirector Mobile. Afterwards the media browser is in the upper left corner of the app. On the first tab you’ll find your videos, the next tab is for photos (which can be used like videos, but contain no sound!) and then audio. That’s how to find voice recordings in PowerDirector Mobile made with an external sound recorder. Navigate (with the arrow in a circle symbol) to find the right folder. So locate video, photo and audio content on your mobile device and then simply drag and drop the media content onto PowerDirector’s timeline. object by dragging a media library item and dropping it onto a timeline object. or to adjust the display duration of photos. !!! For basic journalistic productions refrain from using dissolves, transitions, swipes or other video effects. Use only hard cuts. Under media selection in PowerDirector Mobile, Audio (see step 1), you’ll find a but­ton Overvoice. After hitting you will see a red REC button and a sound meter. Position the blue cursor line at a spot the sound recording shall start and click REC. An indicator will give you a few seconds to prepare to speak. Record your overvoice while speaking into the build-in microphone of the device. When finished, you can trim the recording (see step 3) and move to adjust to the exact space while repeatedly playing the com­po­sition for monitoring. PowerDirector Mobile provides several produc­tion op­tions. You can produce a video file in MP4 format, or upload your videos directly to Facebook & YouTube. The best way is to save the video on your smartphone first. Click in the editor on the (here: yellow) play-out button. In the next menu you can choose where to produce the video to: „Produce & Save Movie“. Choose the quality HD video (MP4, 30 fps). Afterwards the video is in the camera roll of the Smartphone. There is an easy way to transfer your video editing projects from mobile de­vice to a PC: Back up your project to the CyberLink Cloud. Download and then continue work on your PC for more sophis­ticated editing. Happy for feedback: how does non linear editing work on a Smartphone? How do you like editing with PowerDirector on a Smartphone? Which NLE editing app is the best? Tips and workarounds for #MoJo video journalism? 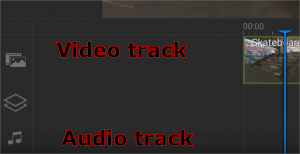 Any problems while editing which can’t be solved? Do you know my concept of #oneshot reporting: no cutting? Bitte um Rückmeldung: wie gut funktioniert das Schneiden am Smartphone? Wie gut klappt das Schneiden mit PowerDirector oder einem anderen Programm? Welches Programm ist das Beste für #MoJo journalistische Beiträge? Tipps für die Benutzung oder versteckte Funktionen? Welche Kniffe oder Probleme gibt es beim Schneiden? Kennt ihr mein #Oneshot Konzept: Drehen ohne Schnitt?